What does a 12-month marijuana suspension get you? Well, according to UFC president Dana White, Nick Diaz gets next dibs at Georges St-Pierre’s (Pictured) welterweight crown once his ban is lifted. White made the announcement following Thursday’s press conference in Seattle. The rivals were slated to meet in the most anticipated 170-pound affair in MMA history at UFC 137. However, Diaz was yanked from the pay-per-view broadcast after ditching back-to-back “beauty pageants” to promote the October 2011 extravaganza. 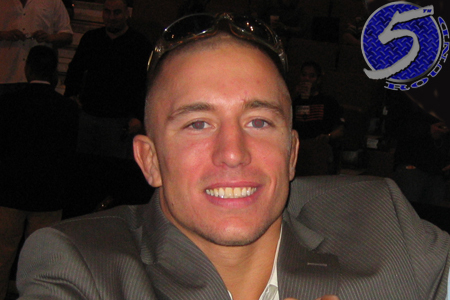 The organization ultimately rescheduled the contest for UFC 147, but St-Pierre was forced to bow out with a torn ACL. Diaz was then assigned to headline the February contest opposite Carlos Condit for the interim welterweight title. Diaz ended up losing a unanimous decision and was so baffled by the verdict that he threatened to retire from the sport. A few weeks later, the 29-year-old was busted for having marijuana metabolites in his system for the second time in five years. The Nevada State Athletic Commission subsequently banned Mr. 209 for one year. Diaz has been riding the pine ever since. He’ll be eligible to reapply for licensing as early as February 4th, 2013. St-Pierre ended his 19-month hiatus in triumphant fashion by unifying the welterweight belt against Condit at UFC 154. No word on when “Rush and Diaz will do battle. Sorry, Johny Hendricks. It looks like you’ll have to take another tango. Oh, and it appears the GSP vs. Anderson Silva fantasy fight remains just that.